Delicious and nearly extinct, can white abalone be saved? 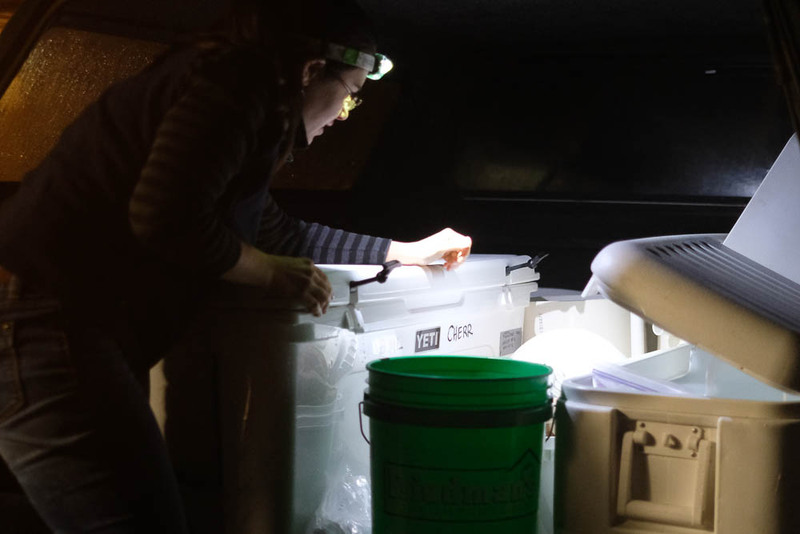 On a rainy winter evening, biologist Kristin Aquilino was rummaging through the trunk of her pickup truck in the Bodega Marine Lab parking lot. She was looking for a rubber spatula—a tool she needed to pry a recently captured white abalone from inside an ice chest brimming with seawater. Aquilino had driven the rare animal 385 miles from Los Angeles, where it was captured off the coast, and where small numbers of this endangered species can still be found. She was about to introduce the 7-inch marine snail to its new home, a research facility at UC Davis’ Bodega Marine Lab in Bodega Bay. Now Aquilino had the unenviable task of trying to pry loose the creature’s squishy orange foot without injuring it. Any nick to this male abalone’s flesh, or chip to its shell, could cause the snail to bleed uncontrollably since its fluid doesn’t clot. “I’ve been studying these animals for years and this is one of the few wild white abalone I’ve seen,” says Aquilino, an abalone expert at the Bodega Marine Lab. That’s because there are more white abalone living in captivity than there are in the wild. And the mollusk in Aquilino’s hands is the first wild white abalone scientists have collected from the ocean in more than a decade. These rare creatures are incredibly difficult for divers to find in the deep waters where they live. “We’ve been working for six to seven years to find loner abalone along the coast,” says fish biologist Dave Witting from the National Oceanic and Atmospheric Administration. Not only was the abalone difficult to spot, but Witting needed a special Endangered Species Act permit to collect him—a permit that took two years to acquire. So the animal’s arrival at Bodega Marine Lab was historic. 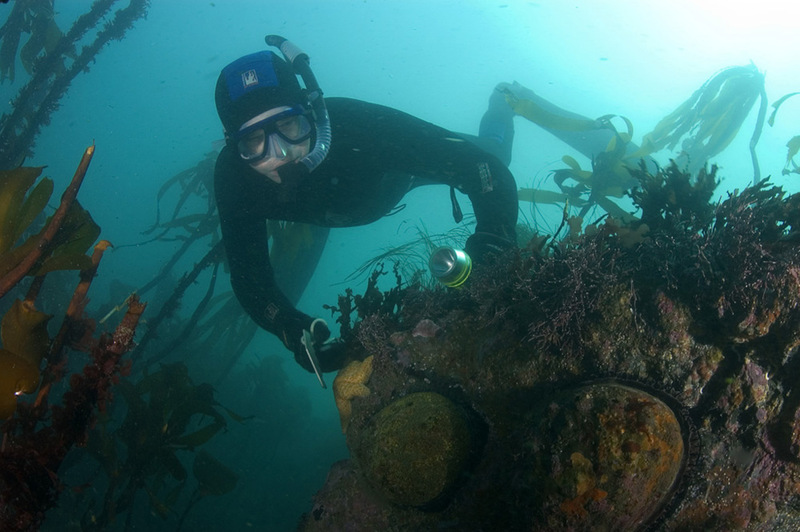 Aquilino gingerly placed the snail inside a bright blue bucket at the lab, where her 12-person research team runs a captive breeding program to protect white abalone from going extinct. 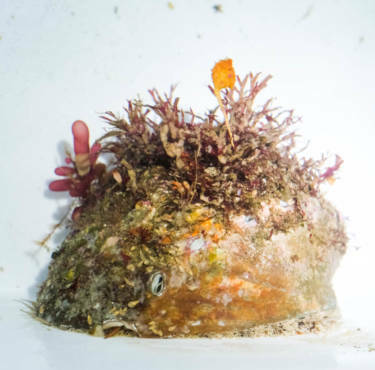 Like all new abalone that arrive, he received a nickname: abalone 314 or “Pi.” Researchers were hoping Pi’s arrival would introduce new DNA into the aging captive population, creating stronger offspring with more genetic diversity. White abalone was once a delicacy at California seafood restaurants, the most highly prized of all abalone species for its soft meat. Then it disappeared from menus in 1993 when the fishery was closed due to overfishing. Buzz Owen, a retired commercial and recreational abalone diver, recalls his abundant abalone catches back in the ’50s and ’60s. “There was no limit on the number you could take,” says Owen. 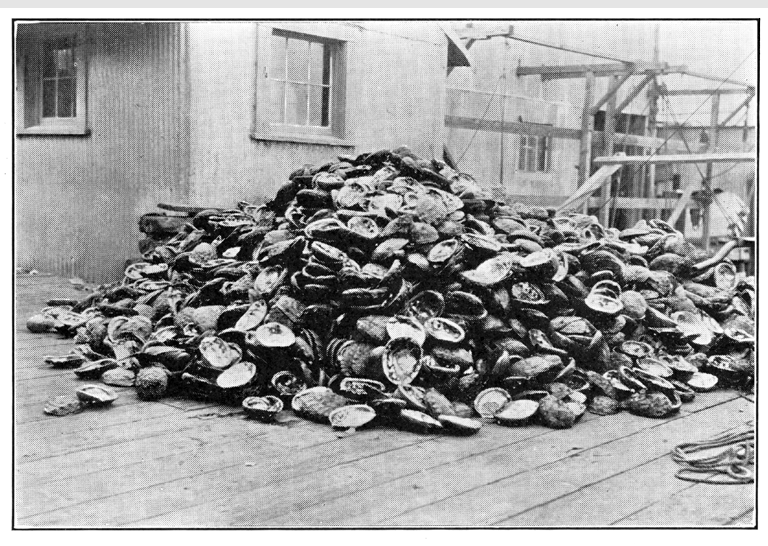 Size limits on what divers could catch were intended to protect abalone so they could mature and reproduce. But it wasn’t enough to prevent the numbers from dwindling to a crisis point. The scattered survivors were too far apart for their ejected sperm and eggs to mingle, so spawning was rarely successful. Then in 2001, white abalone became the first marine invertebrate to receive federal protection as an endangered species after the population had declined by almost 99 percent. 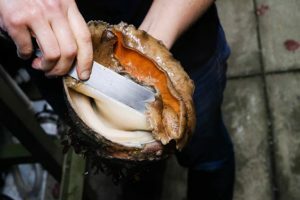 The success—or failure—of white abalone now depends on the breeding program at the Bodega Lab, and six other organizations, including the California Department of Fish and Wildlife and NOAA, that support the effort. During the first captive breeding attempt at UC Santa Barbara in 2001, the parent abalone created 100,000 juveniles, but almost all of them died due to a fatal wasting disease called withering syndrome. In 2003, the Channel Islands Marine Resource Institute in Santa Barbara bred the abalone again and after the Bodega lab received a permit in 2011, it bred animals in 2012. Captive breeding was finally turning a corner. Between 2012 and 2014, the number of abalone that survived to be juveniles increased threefold. There are now 8,000 juveniles living in captivity at Bodega’s lab. They haven’t been released into the wild yet because scientists still need to test methods for introduction into the ocean—an environment the animals have never experienced. When Pi arrived at the Bodega Lab, Aquilino was excited about breeding him in March. White abalone only spawn once a year so timing is critical. It would be the first breeding of a newly collected abalone in more than a decade. But even hopeful stories don’t turn out to be happy ones. In early February, 15 weeks after Pi’s arrival to Bodega, Aquilino sent an email with “cruddy news.” He didn’t survive. “We don’t know why,” she later explained over the phone. In late February, Jim Moore, a California Department of Fish and Wildlife shellfish health expert, examined the animal’s tissue, and says “Pi” may have developed a foot infection, though he couldn’t be sure. “We may never be able to pinpoint cause of death, that is just the way it is sometimes,” says Moore. She was one of 13 animals that successfully spawned on March 1. For the scientists, it was a big deal. “Pretty cool that there are new genes in the program for the first time in 14 years!! !” Aquilino said in an email to colleagues a day after the event. Green 312 and four other female abalone from the original captive group produced about 14 million eggs. By the next morning, scientists woke up to find millions of embryos. Bodega Marine Lab and six other agencies have a five-year plan and expect to be ready in about two years for a release of thousands of young white abalone into the wild. This report was produced by KQED Science. You can view the original report on its website.